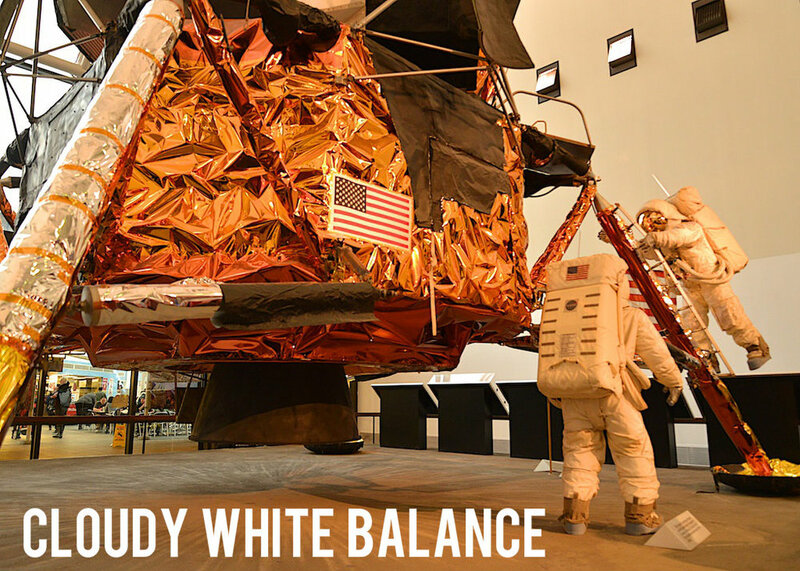 If you visit the Lunar Module exhibit at the National Air and Space Museum, you might notice the Apollo space suits look white. Try to take a photo however, and your camera could render the moon landing scene any variation of yellow to blue. What on earth?! You just experienced the frustrations of white balance. In any given scene, your digital camera sensor is trying to replicate the range of colors it sees. Because different light sources emit different temperatures, your camera could have a hard time capturing colors accurately. If we understand how this process works, our job as photographers is then to match the color temperature of the light falling on our subject with the white balance settings in our cameras. Does that sound complicated? It really isn't. If you are looking at the lunar landing scene and yellow lights are used as spotlights, you know your photo could have a yellow cast. Your eyes will still see the space suits as white, but your camera might be fooled by the "warm" light. There are a couple ways to fix this problem. Many camera manufacturers try to simplify the color correction process by creating white balance presets of common lighting conditions. For instance, digital cameras will have options like Sunny, Shade, Cloudy, Tungsten, or Florescent. Match the setting to your lighting condition, and it can help fine tune your results. Here's what the Lunar Module looks like with each of the white balance presets. Presets aren't always accurate, however. Even worse, I might notice that multiple light sources illuminate my subject. The lunar scene is also covered in florescent light as wellas natural light streaming in from the windows. Now the camera doesn't know what to do. That's why most cameras will also include a custom white balance setting. The term white balance gets its name because once we tell our digital camera what should be white, it can can balance out all the other colors and represent them accurately. To calculate custom white balance, use a white card or some other white object. Fill the frame with the white from the card and take a reference shot. You are telling your camera, 'this is what white should look like in this lighting condition.' Your camera does the rest, and all your photos in that light should now display your colors accurately. By the way, you can also use an 18 percent gray card to calculate white balance. Neutral gray will reflect all colors equally. Savvy shooters know that when you shoot in Raw format, your camera will capture everything it sees and ignore your white balance correction. In that case, you will use the same process to correct colors in software like Adobe Lightroom or Apple's Aperture. Carrying a white card can be a bit cumbersome, so some smart people at Expoimaging created a product called expodisc. This is one of my favorite white balance correction tools. The expodisc fits snugly over the lens like a filter. Point your camera at your light source and take a custom white balance reference shot. No fiddling with white cards, and you get perfect color. With just a few steps, I can take a scene like the moon landing and get accurate color. Try it the next time your camera isn't capturing color accurately.